Subject:— Items proposed by the Staff-Side, NC(JCM) for discussion in the National Anomaly Committee — Comments of DoPT regarding. I am directed to refer to your letters No. NC-JCM-2017/7th CPC Anomaly dated 16th August, 2017 and 31th August, 2017 with which a total of 18 items have been sent to DoPT for discussion in the NAC meetings. These 18 items are about various issues over which, the Staff-Side has opined, anomaly has arisen as a result of the 7th CPC’s recommendations or absence of them. As against the Minimum Wage decided to be Rs. 18000/- by the Govt. w.e.f. 01.01.2016, the Staff-Side has said that this should be not less than Rs. 26,000/-and the multiplication factor ought to have been 3.714 and not 2.57. They have further asked for the pay matrix to be changed. Objecting to the methodology adopted by the 7th CPC in computing the Minimum Wage, they have given a number of reasons like the retail prices of the commodities quoted by the Labour Bureau being irrational, adoption of the 12 monthly average of the retail price being contents to the Dr. Avkrovd f ormula, the website of the Agriculture Ministry giving the retail prices of commodities forming the basis of computation of minimum wage provides a different picture, so on and so forth. However, when one compares this item with the three situations given in DoPT’s OM. No. 11/2/2016-jCA dated 16th August, 2016 and 20th February, 2017, it does not appear that this satisfies any of them to be treated as an anomaly. The Staff-Side argues that in spite of the foreword to the Report making it clear in para 1.19 that the prevailing rate of increment is considered quite satisfactory and has been retained, an illustrative list appended by them shows instances where the pay, gone up after the addition of annual increment by 3%, falls short of what it would have been. They have quoted para-5.1.38 of the report also which states that the rate of annual increment would be 3%. 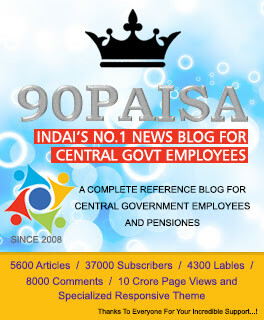 While what the Staff-Side has stated has its own merits, the fact of the matter is that the principle followed here is whenever a stage of pay, after addition of an increment, falls short of the nearest hundred by less than 50, the employee would be entitled to get the amount mentioned in the immediately next cell in the Pay-Matrix. However, when the gap is that of more than 50, the pay, on addition of an increment, is rounded off to the nearest hundred which travels backward. For instance, if staying at Rs.46,100/- one gets an increment @ 3%, instead of having his/her pay fixed at Rs. 47,483/- (which is the exact figure), it will be Rs. 47,500/- (thus gaining by Rs. 13/-). Thus it is not a case of permanent loss as the loss in one year is made good in the second/third year. Considering this to he a situation of swings and roundabouts, this may not be treated as a case of anomaly. The Staff-Side has taken exception to the index rationalization followed by the 7th CPC while formulating its views as per which the fitment factor varies and moves upward as one goes up the hierarchical ladder with the level of responsibility and accountability also steadily climbing up commensurately. The Staff-Side argues that the multiplication factor should be one, i.e. 2.81. Although the Staff-Side has remonstrated that the vertical relativity will suffer distortion in the process, it has to be stated that it is a policy decision about by the Staff-Side comes to be distorted when the pay of a feeder-cadre post and that of a promotional post becomes same. In this case it is not so. Hence it does not appear to qualify for being called an anomaly. The Staff-Side says the minimum pension fixed after 7th CPC should be corrected and revised orders issued. From the brief explanatory note recorded under this point, it appears that the CPC had sounded out D/o pension on what the latter thought what the minimum pension should be. This is an exclusively pension-related issue on which, as informed by the Staff-Side, D/o Pension was asked for their views by the 7t1 CPC. Moreover, as will be evident, the basic focus of DoPT’s Q.M. No. 11/2/2016-JCA dated 16th August, 2016 and 20th February, 2017 is on taking on board those anomalies which are pay-related. Hence, this item may be taken up separately by the Staff-Side with the D/o Pension. Thus, instead of treating this as a case of anomaly, the Staff-Side is requested to take it up with the D/o Pension separately. Date of effect of allowances HRA, Transport Allowance, CEA etc. The Staff-Side has demanded that the grant of the allowances (revised) mentioned alongside should be made effective from 01.01.2016 and not from 01.07.2017. Anomaly in the grant of D.A instalment w.e.f 01.01.2016. Here the Staff-Side has questioned the methodology adopted by the Government in computing the DA instalment w.e.f. 01.01.2016. It has, however, to be pointed out that even if there is merit in the contention of the Staff-Side involving this item, it does not qualify being called an anomaly when it is examined in the light of the three situations which, as per DoPT’s Q.M. No. 11/2/2016-JCA dated 16th August, 2016 and 20th February, 2017, would constitute anomalies. 3. Items to be taken up at the Departmental Anomaly Committees. Implement the recommendation on Parity in Pay Scale between Sr. Auditor/Sr. Accountant of IA&AD and organized Accounts with Assistant Section Officer of CSS. The Staff-Side says that although the 5th, 6th and now 7th CPC’s have recommended that the pay-scales of different cadres/categories/grades requiring the same recruitment qualifications should be the same, denial of the same benefit to the Statistical Assistants (SA’s) who are otherwise at par with Assistant Section Officers (erstwhile ‘Assistant’) is a violation of the principle. While ASO’s are placed in the Pay-Matrix of 7, SA’s are in the Pay-Matrix of 6. This arrangement is stated to have disturbed the horizontal relativity between the pay-scales of the SA’s in the Organized Accounts and IA&AD Cadre and ASO’s in the CSS cadre. In conclusion, it has been requested that SA’s should also be placed in Pay-Matrix no. 7. Even if, the present case comes across as one of anomaly, it appears that the interests of the Statistical Assistants only are involved. ASO’s of CCS are coming into the question; but only as a reference point, by way of comparison. Hence the Staff-Side is requested to take up this issue at the Departmental Anomaly Committee concerned. This particular item is exclusively Railways-specific. The Staff-Side, NC OCM) is requested to take it up at the Departmental Anomaly Committee of MR) Railways. Anomaly in the assignment of replacement of Levels of pay in the Ministry of Defence, Railways, Mines etc in the case of Store Keepers . Staff-Side says that although ‘Store keeper’ is one such category of posts which is common to various Departments like Defence, Mines, Railways etc and in spite of the nature of job, responsibilities being similar, the pay-scale of storekeepers across all the Departments is not the same. It is still less in the M/o Defence even after the entry-level qualifications which were different before the 7th CPC stage, have been revised. If what the Staff-Side remonstrates that even after the requisite changes had been carried out in the R/Rules, the 7th CPC did not take any cognizance of it is true, it has to be assumed that it is a policy decision of the Government. Moreover, the issue appears to be M/o Defence-specific. The Staff-Side is requested to take it up at the Departmental Anomaly Committee meeting of the M/o Defence. 4. Item to be taken up separately with the Department of Pension. As per the ToR of the NAC, anomalies are basically pay-centric. Under this point, the contention of the Staff-Side is pension-centric. Furthermore, the Staff-Side has themselves clarified that post-7th CPC, Government had set up a CoS headed by Secretary(Pension) to look into the first option recommended by the 7th CPC. Eventually, this was not found feasible to be implemented. With such a decision having been taken at the CoS level, it cannot be called an anomaly. In view of this, we may inform the Staff-Side to separately take it up with D/0 Pension without treating it as an anomaly that can be taken up at the NAC. 5. More details required to examine the following item. Parity in Pay Scales between Assistants/Stenographers in field / subordinate officers and assistant Section Officer and stenographers in CSS. Although the heading of this item is self-explanatory, the relevant text given in the paper sent is not complete as the pay-scales of Assistants and stenos posted in field have not been mentioned therein. Until their pay-scales are known they cannot be compared to check whether there is indeed any anomaly. The Staff-Side is requested to provide more information that is relevant so that it can be properly examined to find out whether an anomaly arises here or not.